I know you all've been on pins and needles waiting to find out if we went with the box spring or not with our found-on-the-street West Elm bed frame. Thank you all for your helpful comments. Since we are modernists and shrimpy, we decided to go without the box spring for easier leaping into bed and a more minimalist look. In my spendy whirlwind, I bought a gray blanket from Kmart on sale and with an online promo code for $16.19. It's a light silvery gray and very soft. Any Kmart New Media Marketing Persons out there listen up - my online shopping experience with Kmart was perfecto. I was sucked in via an ad in the September issue of Glamour, which featured these Mary Janes. While at Kmart.com, I tossed in the blanket and a sweater I had no need for but couldn't resist for $6. Lots of brand-new shrink-wrapped fun for only $33.88. Speaking of spending, now I'm looking for better lighting in the bedroom and thought some sconces hooked to the headboard might help. Also sconces could eliminate some night stand clutter. But sconces are ridiculously expensive. Plus you need two of them. I searched all my favorite rock-bottom lighting places and finally landed on this architect's lamp from the Crate and Barrel outlet for a mere $30 a piece. 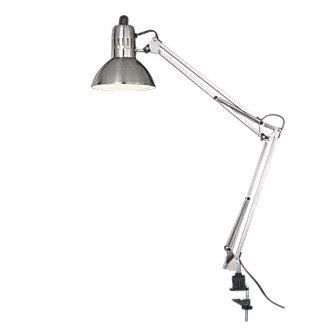 I love swing-arm lighting, expecially of the brushed silver kind, which tend to run $150 to $200 a pop. But is this incarnation too office looking? 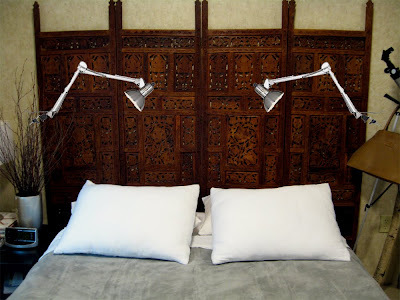 Below I cut and pasted the lamps to the headboard. Looking good! I love that shade of grey. I love your headboard so.much. that I'm not sure if the lighting would work or it would take away some attention from your beautiful bed? any thoughts on maybe spray-painting the lamps to better match the headboard? I actually like the juxtaposition of those lights with your more ornate headboard. It's a great mix! Nice work - I like the finished room. The headboard is fabulous. 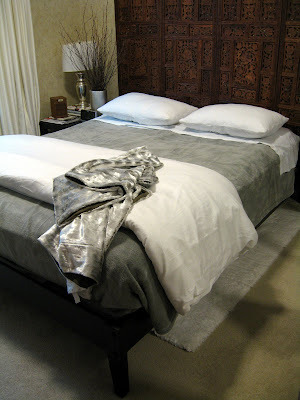 I'm trying to find a white one like that for our guest room. I think the architectural lights work well actually - I love contrasting old and new. Providing the light is soft enough for a bedroom, I say go for it! I think also I don't like it attached to the headboard itself. Perhaps if they were attached to the walls a few inches past the headboards (which I know is much more of an installation pain) they'd look less industrial and imposing? I don't want to paint. If I have to paint, I won't buy them. I know me. Attached to the walls would look better but the wall attaching kind are lots more money. I probably would not even do a sconce in that case. Have you by chance looked at Ikea's attached-to-the-wall lighting options? They seem to have a few available which are very well priced. Thanks for the tip. The Kramare might work and it's only $10. In terms of lighting, I've seen those lamps used for all sorts of things lately, and I'm not a big fan. I have a feeling, though, that it's just bc they remind me of the long endless nights working in my studio when I was in architecture school. It's been my experience that lower end adjustable lamps give out very quickly, becoming floppy and suffering from loosening bolts. I've never had one for more than a year. I like the Kramare. Your new bed is really lovely.The lamp is also nice but it looks a bit robotic. Yeah, now that I've had time to think about it, I don't think it will work. I like the bed but it will look better if you choose different colur combination as just keep away these 2 table lamps which covering top area of bed.